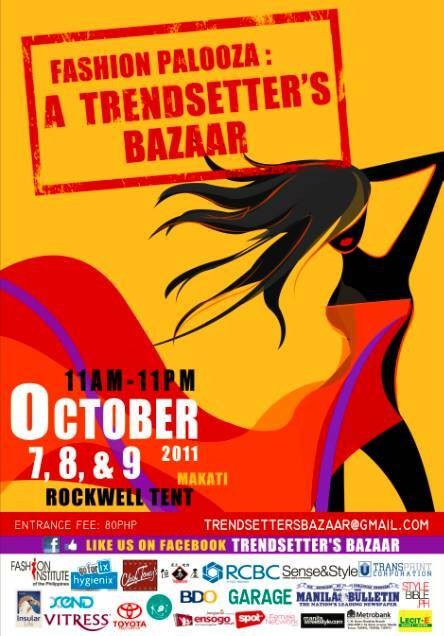 The wait is almost over as the trendiest bazaar hits Rockwell Tent this Oct 7-9! Get ready to go gaga over the latest, fiercest & most fashionable pieces as Trendsetter’s Bazaar will be housing a wide range of clothing, shoes, bags and accessories from your much-loved brands! Also watch out for truly unique items from new breed and up-and-coming fashion designers from Fashion Institute of the Philippines! Participating brands are: Stylebreak, Monroe, La Pirouette, Olivia and Fifth, Koi Swimwear, Phoemela Baranda, Jean and Rosz, Das My Shoes, Faith and Fashion, Style On Air, Peace Love Fashion, Eight.One, Soule Phenomenon, Sewn Sandals, Fashion Galore, Estrella Manila, Pink Chocolate, Sole Sister, Hoola Clothing, Props, Argan Moroccan Oil and much much more!!! Some of your favorite food concessionaires will be there as well! So Coffeeholics, what are you waiting for? Don’t be left out! We’re sure that whatever your style preference is, there’ll be a brand that would satisfy your inner fashionista. Don't forget to like Trendsetter's Bazaar on Facebook and spread the word! FREE ENTRANCE TICKETS to the Fashion Palooza. 2. Like Kaisensei's Brew of the Day Facebook Fanpage. 3. Follow Kaisensei on Twitter. 4. Email me your full name and contact no. 5. Post a comment here saying that you want to be a Trendsetter and that you have emailed me already. will be announced on October 5.
post on facebook the picture above and tag your friends..
Para nman may reward ang nageffort. hihi. Be a Trendsetter! See you at Fashion Palooza!